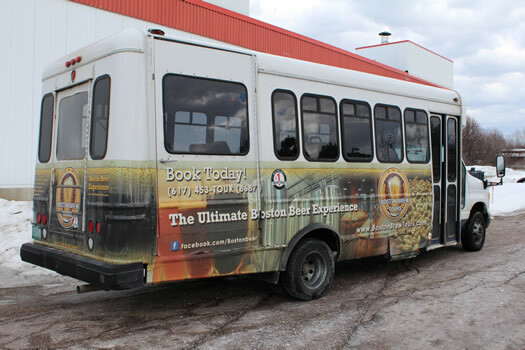 We went on this tour through Burlington Brew Tours, an organized group that also provides transportation around Burlington. They have a few different options and times for tours -- we went on the "Classic Brew Tour" during the day on a Saturday. Our guide, Matt, picked us up from our hotel around 10:45 am in a small bus and we then collected the other 10 people from various locations around Burlington before moving on to the tour stops. 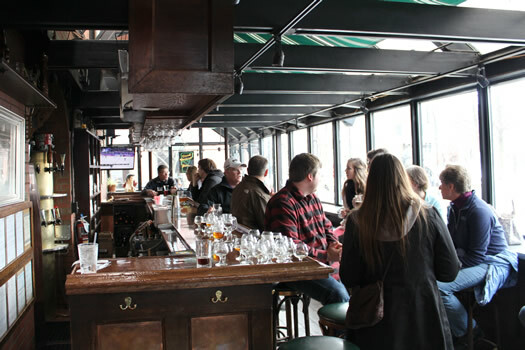 The first stop was Vermont Pub and Brewery, located right in downtown Burlington. We immediately went downstairs to see where the beer is brewed. It's a very small operation, but we squeezed in around the basement to see all of the equipment for brewing, storing, and serving the beer. One room had all the kegs with dozens of taps running up to the bar upstairs. Our guide Matt walked us through the whole operation, and he seemed super knowledgeable about every step. 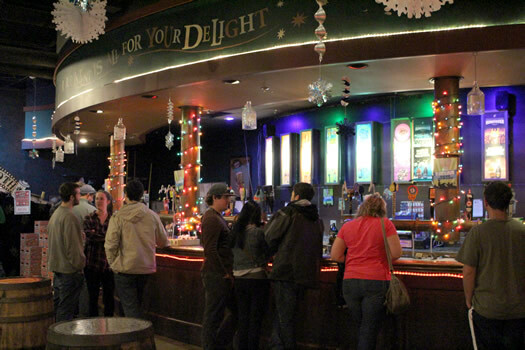 After our tour we went upstairs to start our morning off right with four samples in the bar area of the pub. The Regal Lager, our first tasting, was very light and had a subtle taste. It ended up being my favorite beer, perhaps of the whole day. Next was a Burly Irish Ale, which had a caramel or coffee taste. It was smooth, but not my favorite. The Bombay Grab IPA, our next taste, smelled super citrusy. It was very light for an IPA, and had a fruity taste. For an IPA, I enjoyed it, but it was still a little too bitter for me. Lastly, we tried a Wee Heavy 90 Shilling, which was sweet and creamy. Even though it was a heavy beer, it was my second favorite of Vermont Pub and Brewery's samples. After a quick bus ride we arrived at our next stop: Switchback Brewing Co. Its operation is much larger than Vermont Pub and Brewery. Before tasting anything, our group was brought to the back for a very comprehensive tour. The scale of brewing at Switchback is impressive, and our guide talked a lot about how they've grown during the 11 years they've been open, moving from a lot of labor-heavy processes to upgrading equipment in order to make things more efficient. The bottling and labeling equipment is especially interesting. Since it was a Saturday, they weren't bottling, but we were able to get up close and ask questions of the brewer. For samples, Switchback has a small tasting room and shop. There were two beers on tap that day. The first, their Unfiltered Amber Ale, was a little bit bitter, with a hoppy flavor. The second, the Dooley's Porter was a strong porter with a coffee flavor. The porter was a little too heavy and strong for my wine-lover's palate. I didn't prefer either of these samples, and was a tiny bit bummed there were only two options to try. However, the tour was very interesting and the most in-depth look we had at brewing all day. 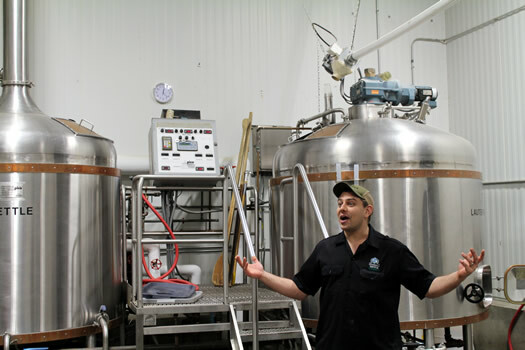 As we were leaving, a much larger public tour was starting (the brewery offers public tours on Saturday afternoons). Our next stop was in Shelburne, south of Burlington. Fiddlehead Brewing Company was the smallest brewery on the tour. They had a small tasting room and shop with a large window looking out into their brewing facility. We didn't get a tour of the brewing area, but instead went straight into the tastings. They also only had two beers on tap and, unfortunately for me, they were both IPAs. The first was Fiddlehead's IPA which was a little bit fruity, but also bitter and had a biting aftertaste. The second beer, Second Fiddle Double IPA, was bitter immediately. It was probably my least favorite taste of the whole day. I was completely ready to cleanse my palate of IPAs when we moved on to lunch at Folino's. 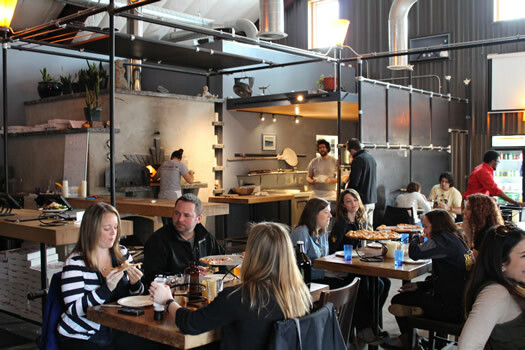 It's a small wood fired pizzeria in the same building as Fiddlehead. Our group had a large table set aside, with various types of pizza set out. The thin pizza was really delicious and I quickly devoured about 5 slices. My favorite was a margherita pizza with fresh basil. We also had growlers of the two Fiddlehead beers, but I didn't like either IPA, so I just had water. Our last stop of the day was at Magic Hat in South Burlington. It had the most commercial setup, with a very large gift shop next to a long tasting bar. Magic Hat also has a formal area to take tours through, but our guide Matt took care of that. 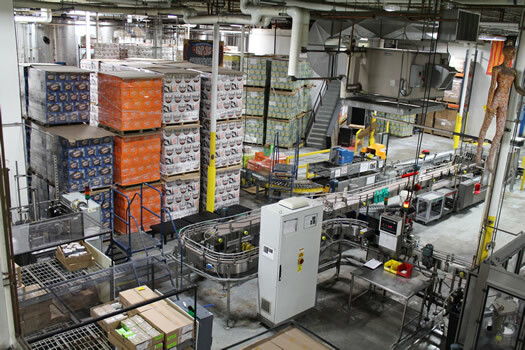 At one point we looked down onto the manufacturing and bottling floor. It was unreal to see that much beer stacked up. At the tasting bar, I tried five different beers. Any guest is allowed four each for free, but I shared with my fiancÃ© to maximize my tastes. First I went with the classic Number 9, which was clean with a little IPA taste. They say it has an apricot flavor, but I didn't really taste much of one. Next, the Maple Chocolate Stout was a serious beer. It has chocolate and smoke flavors and was not for me at all. The Dream Machine IPL is supposed to be a lighter IPA, but I found it to be still very bitter and didn't like it. The Circus Boy Hefeweizen was more my style since it had mild flavors and was easy to drink. Lastly, the Single Chair Ale had an extremely mild flavor and tasted like a wheat beer. After Magic Hat, we were the first ones dropped off at our hotel, arriving around 4 pm. We both enjoyed our day touring. The pace of the day was very relaxed, and the tours focused a lot on learning the different processes. Home brewers in the group were very interested in the brewing specifics, while I just tried to follow along. The beer samples were generous, but it was not necessarily a party atmosphere, and even lightweight me didn't get buzzed throughout the entire day. My favorite stop of the tour for beer was Vermont Pub and Brewery. It had the greatest variety of different things to sample, and they're right in downtown Burlington. My favorite behind-the-scenes tour was at Switchback, where a brewer gave a thorough and interesting rundown of the company's history, brewing process, and bottling equipment. 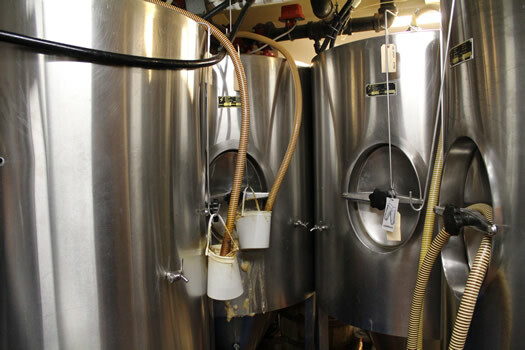 The full price of the Burlington Brew Tour is $70 per person, which included the transportation, tours, samples, and lunch. For a beer enthusiast, this would definitely make a great day. If you're like me, and a little picky about your beers, you're probably better off doing self-tours and tastings yourself. But it was nice not to have to worry about driving and directions. Maybe a beer drinker should do a story like this to provide some objective analyses. Liking the area and number of samples provided is a nice intro, but I would prefer knowing about what makes each brewery different and what makes their beers unique. Give me a reason to go to these breweries in the first place. Agree Ace. Having sampled all of the above breweries, I couldn't disagree more with the writer, but to each their own. At the very least, it makes me want to head back up to Burlington area once the snow melts and do a hoppy bear tour. As someone who is NOT a huge beer drinker, but is always looking for interesting things to do, I liked this article. (And I hate IPAs, too.....). How can you go to the Burlington area and completely miss sampling the far-and-away most popular beer in the state - Heady Topper from The Alchemist?? Not to mention, going to a place like Farmhouse Tap & Grill and sampling the offerings from Hill Farmstead, who is largely regarded as one of the best breweries in America? What about Lawson's Finest Liquids and their super-small, but delicious operation? This whole tour is an unfortunate glossing over of the larger beer culture in the Burlington area. I hope others reading this do their own research and learn about the bigger, richer picture. I recently went on a trip to Vermont to see Phosphorescent play and on the way back my fiancÃ© and I did our own beer tour. I love beer, brew my own, and when I drove cross-country from Seattle to NY I stopped at breweries all along the way (FYI Montana has some of the best. Must be something in the water) to give some background of my palate. My fiancÃ© and I were pleasantly surprised with the small run beers that we tasted at Magic Hat. We really enjoy the chocolate maple stout and they had this sour IPA that was really interesting. We are kicking ourselves for not getting a growler of that sour IPA! We also tried Fiddlehead and I wasn't a huge fan of their stuff either...for me they were more bitter than I tend to like. Sometimes I think brewers like to try to out hop each other and this may be the case with Fiddlehead. Our final stop was Drop-In Brewery which is also a school. They had some excellent beers including a Christmas ale based off the brewer's mother's fruit cake recipe. The sound of fruit cake may scare off some but this was one of the best Christmas ales I've enjoyed. It had the right amount of spice to it. This isn't very in-depth, because we were just having fun stopping at breweries on our way home from the show and I wasn't taking notes, but it is another opinion for those that might like to hear a different prospective. I did the Boston version (same company) of this tour, and it was a fun experience. Not all breweries are covered, but different places are part of different tours. Check the website to get a listing of all the possible stops on the tours. Hopefully can check out Burlington in the spring. 2 things: Sean apparently missed the whole point of the article...it was a Burlington Brewery Tour. The Big 3 breweries in VT are some of the best beer brewed in the world, but they're not in Burlington. And whenever someone says they don't like IPAs, there's a good possibility that they've never tried Heady Topper or Lawson's Double Sunshine or HF Abner (or any HF IPA/DIPAs for that matter). Give them a try and if you still don't like that type of beer, then I'll believe you. IPA/DIPAs from the big 3 in VT are in a different league from most other beers with that same name. They need to rename that type of beer to: northern VT IPA. Chucky- Thanks for the suggestions. I'm definitely going to check those out to see if there's an IPA I can enjoy. 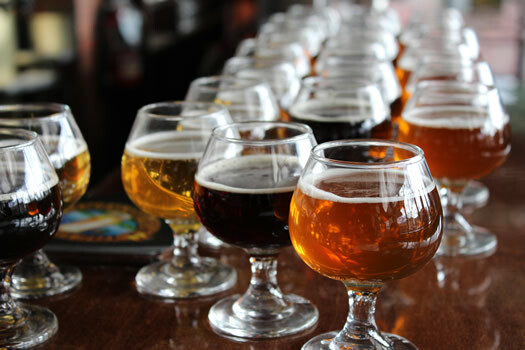 What is a beer tour if not a sampling of the best available beer in a given area? All of the beer I mentioned is VT-based and readily available in Burlington. Heck, I even left out Otter Creek / Wolaver's! You can play semantics and argue that the mailing addresses for these breweries fall outside of city-limits, but their impact on the local beer scene cannot be so easily (or so cheaply) dismissed. 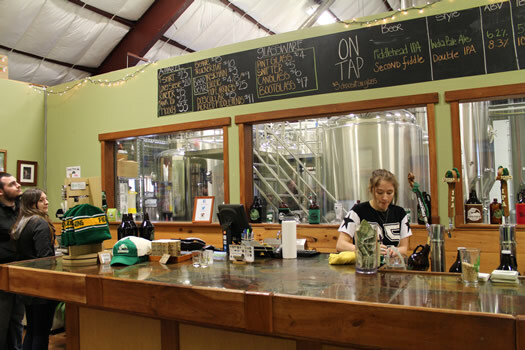 If VT were to hand out participatory medals for beer tours, then I guess Lauren earned hers. Unfortunately though, the beer she tried in no way competes for a podium spot for best in the state, let alone best available in the area! It's frustrating to see her miss out on all of that great beer - sorry if this is coming off as arrogant or overly rude. @Sean: This post was about taking the pre-arranged tour. Short of hijacking the mini bus, I don't think anyone on the tour could have adjusted its route or the breweries visited. That fact was alluded to by Lauren's statement that, based on her own experience with the pre-arranged tour, some people would be better off setting up their own tour so they could better pick and choose the breweries visited to their liking. As you mention, there's a lot going on in Vermont with regard to beer. And I bet we'll be coming back to the topic at some point. So thank you for the suggestions.